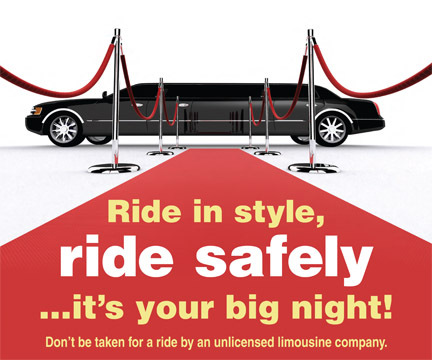 Don’t be taken for a ride by an unlicensed limo company. Prom season is upon us, and many high school students will be trying to make their special night even more fun by hiring a limo. The Department of Licensing reminds parents and students to check to see if the limo they hire is licensed by the state. Limousine operators in Washington are required to be licensed, carry sufficient liability insurance, and undergo annual safety inspections by the Washington State Patrol or City of Seattle. Chauffeurs must be at least 21 years of age, hold a valid driver license, complete a chauffeur training course and pass a State Patrol background check. Berntsen said a website, Craigslist ad, or a simple advertisement in the phone book or newspaper does not guarantee the operator is licensed. Unlicensed limousine operators may not meet state insurance or safety requirements and it can be difficult to hold them accountable if problems arise. To find out if the limousine service you plan to use is licensed by the state, visit the Department of Licensing website at www.dol.wa.gov/business/limousine/. Scroll down to the area for consumers, click on “Look up a business or professional license” and then “Search business license.” If you do not see the business listed as a limousine company, please call 360-705-6744. They can help you verify that the limousine company is properly licensed. You are currently browsing the Licensing Express blog archives for April, 2013.